I want to thank the 50 or so people who came out to the open house on June 19 looking at the site plan application for a 9-storey seniors residence at 1705 Carling Avenue, currently the Webb’s Motel and Rose Bowl. The building is proposed to be a residential care facility and apartments for seniors with 130 and 68 units respectively. It would have 45 parking spaces located underground, and 25 surface spaces. The residential care facility would have 38 of those spaces, the seniors apartments 27, and five spaces would be given over to visitor parking. At the open house, I and my staff and City staff heard clear feedback from those in attendance. I’ve also received correspondence from several residents. First and foremost, many are concerned about the bulk and height of the building. It’s important to be clear that this is a site plan application – the technical details of the proposal. They are not seeking a re-zoning, and the building as proposed would be as-of-right. They don’t need permission for its size. The site is zoned to allow the nine storeys following a 2014/2015 process that re-zoned several “arterial mainstreets” to set a consistent height limit at nine storeys. There’s more information on that process here. 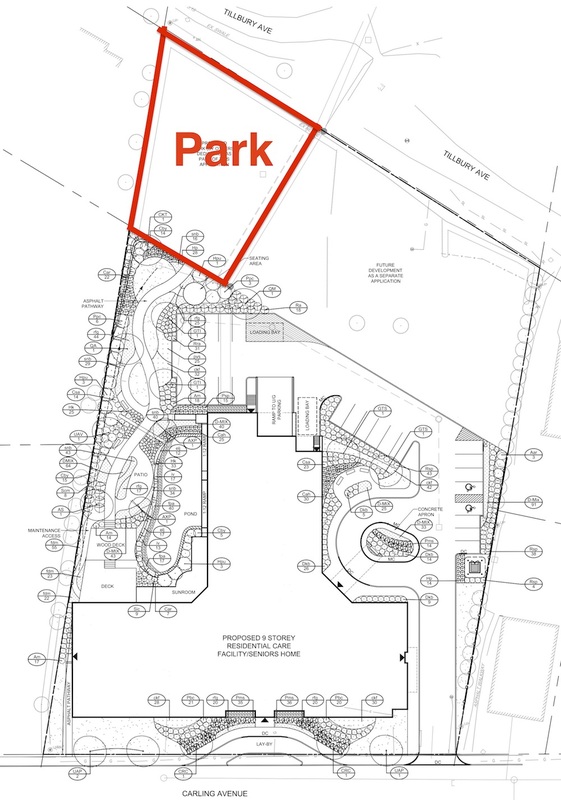 The second concern we heard was around the proposed park on the northwest corner of the site. I’ve highlighted that in the graphic above (click it to make it slightly larger). It’s been proposed – and staff have supported – that the developer will convey this land resulting in a City-owned park at this location, fronting on Tillbury, of around 895 square meters (~9600 sq. ft.). How that park would be developed would be the subject of further consultation between the City and residents. Nearby residents, however, are concerned that if there is a public park at this location that it will end up serving as a public cut-through to the seniors home, encouraging pick-up and drop-off from Tillbury Avenue. This would result, it’s been asserted, in an unacceptable increase in traffic and parking. While the developer is proposing that pick-up and drop-off would be accomplished via a lay-by reached from Carling, some residents have asserted that the more circuitous back-street route will be perceived as safer by eliminating the Carling U-turns. There was some discussion by residents at the open house that the back of the seniors complex could be fenced off from the park, or the park itself fenced off from the street and given to the exclusive use of the seniors residence, to prevent pedestrian cut-through. Most of those in attendance, however, were opposed to the park being implemented at all. I’d be interested in your feedback on this. Finally, the third biggest concern we heard was familiar: an overall increase in traffic. We’ve heard and are trying to address with our traffic calming budget the dangerous driver behaviours we hear about in the area including on Broadview, Highland, Cole, Golden and others. I’ve read the full transportation study, and don’t consider that this development would by itself contribute more traffic to area streets than the existing motel and restaurant use, but I believe we’re hearing the general concerns of residents about overall intensification-related congestion, cut-through and speeding. I would like to work with the developer to see how they might contribute to our efforts to slow traffic down overall in our growing ward. There are a few things to do moving forward. Over the course of the next several weeks, staff will be collecting feedback and asking for changes where they feel those are necessary in order to approve the applicant’s site plan. The planner on this file is Kersten Nitsche, who can be emailed here. I always appreciate being copied on feedback so that I can help advocate for any necessary changes.